The Northern Alberta Section of CITE is hosting a panel discussion to explore how parking is changing and how we, as engineers and planners, in both public and private sectors, can change our practices to better achieve our city-building goals and make the most out of our space. The Panel includes Mark Huberman, P. Eng. of our Edmonton office. Mark is one of the leading parking consultants in the City of Edmonton. He has a passion for parking planning and has worked on a number of significant parking planning related assignments in Edmonton and beyond. 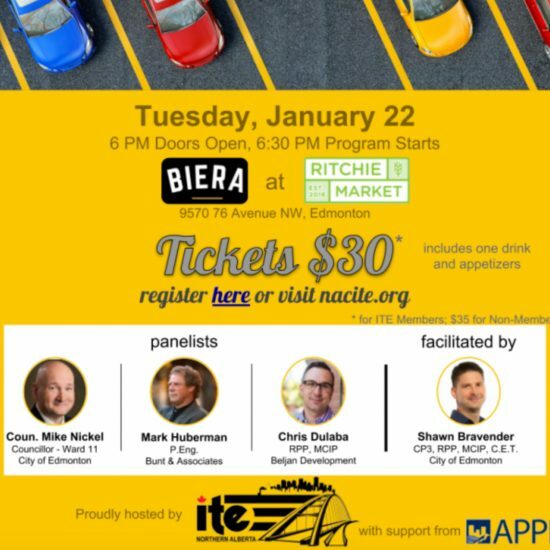 Fellow Panelists include Mike Nickel, Ward 11 Councillor – City of Edmonton and Chris Dulaba, RPP, MCIP – Beljan Development. The event will be facilitated by Shawn Bravender, CP3, RPP, MCIP, C.E.T., City of Edmonton.